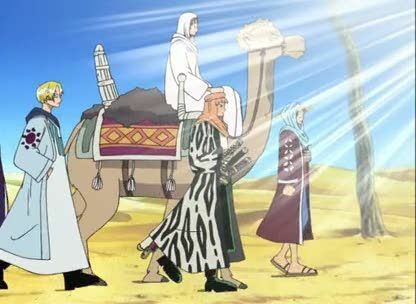 Stream anime episodes online for free, Watch One piece Episode 104 English version online and free episodes. Anime Episode guide One piece Episode 104 English dubbed Luffy vs. Vivi! The Tearful Vow to Put Friends on the Line! The Officer Agents learn that their leader, Mr. 0, is actually Crocodile, and learn that they are going to overthrow the country as part of a larger plan. Mr. 3 reveals that the Straw Hats are alive, and Crocodile dries him up and drops him into a Bananagator pit for failing to kill them. Vivi and Luffy argue over how best to stop the rebellion, as Vivi does not want anyone to die, but Luffy believes that it is unrealistic, and she should trust her friends to risk their lives to stop the rebellion.